Ren: Wait, jump back. It’s against the law for people to dance? So earlier in the week, before seeing the new update of Footloose, I watched the original 1984 Footloose, starring Kevin Bacon, for the very first time. Upon doing this, I found out something that I was not aware of – Footloose is a legitimately good movie and I was never aware of this fact. It rests on the silly logic of having a town under oppression when it comes to the subject of dancing, but the movie is quite enjoyable. With this remake, I can’t say I was excited for it, especially given my newfound appreciation for the original, but I was curious, as I learned it was under the direction of Craig Brewer (Hustle & Flow, Black Snake Moan), who has a good handle on films with a country setting. 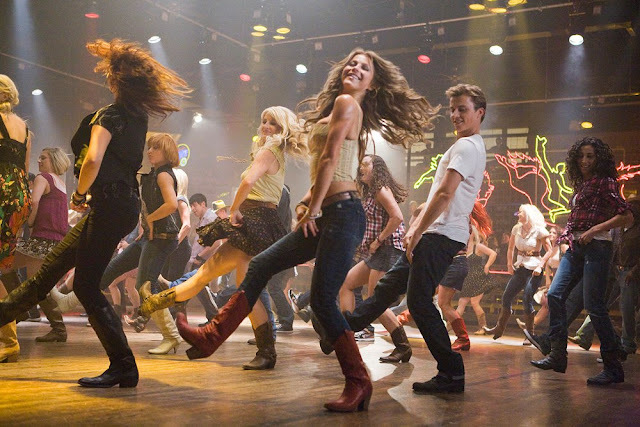 Fortunately, while it goes the carbon copy route, I found this modernized update of Footloose to be quite enjoyable as well. The film begins with an opening prologue that features a crowd of high school kids dancing up a storm, only to end on a sad note, as we watch a group of five get into a traffic accident. The death of these youths leads to the town of Bomont, Georgia establishing a curfew and banning dancing all together. This action was spearheaded by Reverand Shaw Moore (Dennis Quaid). 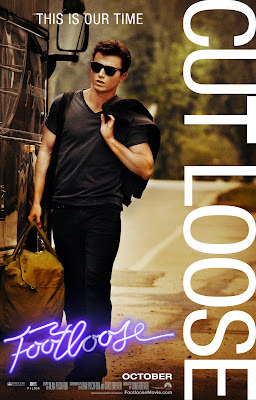 Three years later, a new kid arrives in town and his name is Ren McCormack (Kenny Wormald). Coming out of Boston, Massachusetts, after the death of his mother, Ren is now living with his aunt and uncle, starting anew. He quickly befriends the lovably clueless Willard (Miles Teller) and makes an impression on the various girls in school, including the Rev.’s daughter, Ariel (Julianne Hough). Of course, Ren also quickly learns of Bomont’s strict rules against basically anything that Ren would consider fun. With the various pieces in play, it becomes a struggle for Ren as he attempts to deal with a town prohibiting one of his great joys by rebelling against it, while also humoring the advances of Ariel. There are plenty of ways to approach making a remake of a film. Sometimes you can take the basic elements of a story and spin it off into something new. Other times one can change around the characters, their motivations, their persona, etc. For Footloose, the plan was apparently to make a film that is beat for beat nearly exactly the same as the original. Various elements of the film have been modernized, main example being the tractor duel, which has now been conceived as something either more or less ridiculous, but for the most part, right down to a lot of the dialogue, this film is exactly the same as the original film. But with that said, this did not bother me. It did not bother me because the film is well done. 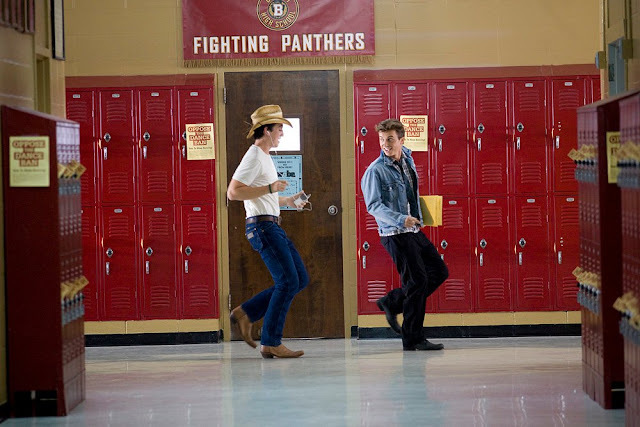 The new Footloose is both an exercise in recreation and an example of how to maintain a level of entertainment properly. It does not feel like an insult, it feels like a well thought out way to appeal to a new generation. What really helps in all of this is Kenny Wormald as Ren. It certainly takes a lot to get over not having Kevin Bacon in the lead, but it is a good thing that I genuinely found this Wormald guy to be pretty cool, which is exactly what Ren was supposed to be. It also helps that the dude can dance. No mistaking the more elaborate scenes for a stunt double (besides some of the gymnastic stuff), Wormald establishes his flashy dancing quite well, which was good to see. While his Boston accent was a bit much (and I guess can’t be helped, because Wormald is from there), the newcomer managed to do a lot right for the part, keeping Ren as a fun hero to follow. Less successful, unfortunately is Hough as Ariel. This wasn’t exactly a part that was well acted in the original either, but it still stands out that Hough doesn’t quite bring it in the dramatic department as well as she needs to. Still, that doesn’t stop Dennis Quaid from being good enough in the role as her father and as the reverend. While Quaid doesn’t quite reach the level of greatness that John Lithgow managed to bring before him, I did enjoy seeing Quaid playing somewhat against type here. And it is also worth pointing out that Miles Teller does a great job as Willard, the best friend and comedic relief who needs to learn how to dance during the film. With the film now set in Georgia, as opposed to Utah like the original, Brewer managed to infuse his countryside and blues-loving sensibilities into this film, which was much welcomed. At the same time, he also managed to find a balance between having things like modern hip-hop and country clash in an effort to realistically and entertainingly show kids having fun dancing with one-another. This becomes apparent in what I can only refer to as “Ren’s Angry Dance Sequence”, which feels less over-the-top this time around, due to the way Brewer incorporates the music and setting. If there is any real complaint, it is the same sort of complaints that apply to the original. While I am aware that towns with dancing laws once did exist, it still seems hard to accept the logic of a modern day town having such a law; however, once getting past that, there does seem to be a lot to enjoy. While formulaic in its structure, there is a level of rebelliousness and enough underdog qualities established within the various characters that makes for an overall nicely entertaining story. It certainly helps that there is a lot of quality dancing scattered throughout this film as well as a solid soundtrack that includes remixes of some of the old favorites from the original. So don’t be afraid to cutloose and enjoy this remake. It’s incredibly familiar, but still a well done update. Ren: Hey, hey! What's this I see? I thought this was a party. Let’s dance!